Expansion designed to keep up with growth. 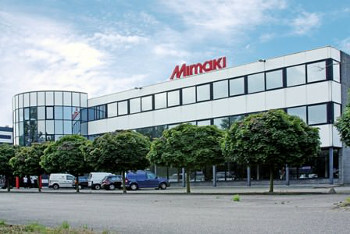 Mimaki Europe’s headquarters in the NetherlandsMimaki has established an EMEA operation which is good news for print service providers in Europe, the Middle East and Africa who will now have easier access to its print systems. The new venture has been set up by Mimaki Euope which has engaged new team members in various departments, ranging from sales and marketing to technical support and logistics. This expanded set-up of Mimaki Europe is designed to help and extend Mimaki’s reach into EMEA. The company said it decided to bolster its European set-up following a significant rise in demand after successfully launching a number of innovative products during 2012, and generating strong sales and leads at key European trade shows. In February, Mimaki attended FESPA Digital and unveiled the JV400-130/160LX – billed as the world’s first environmentally friendly latex printer using white ink. From all accounts it impressed visitors with its high-speed, high-quality output and capability to print on a wide range of substrates. The company simultaneously introduced the JV400-SUV series, which proved a major talking point due to the system’s flexibility in offering solvent printing with the durability of UV-cured inks. Then in May, Mimaki exhibited at Europe’s premier print show; Drupa. The company presented a number of innovative products, including the JFX500-2131, a next-generation UV-LED flatbed inkjet printer with production speeds up to 60m2/h. Some months later in September, Mimaki signalled its move into the photography market when it showcased its latest innovations at Photokina. The company demonstrated the UJF-6042, a new A2 format flatbed LED UV printer with high-end quality, making it ideal for printing images on photo albums or other special materials with photo-like quality. The A3 format UJF-3042 desktop flatbed LED UV inkjet printer was also in the spotlight. Again attendees were impressed with how both systems can print photos on virtually any substrate – like iPhone and iPad covers – without any need for priming. Later that month, Mimaki underlined its green credentials with its attendance at EcoPrint, a sustainability-based trade show. The UJF-3042 was again on show, and was well received due to the printers small environmental footprint and long-life, energy-efficient LED curing. Meanwhile the JV400LX series was praised by delegates for delivering high-quality print with a low CO2 footprint. In April, Mimaki’s advances in print technology were acknowledged by industry professionals, when the company landed two prestigious European Digital Press (EDP) Association Awards. The awards recognise best-in-class products across the digital print landscape. The Mimaki TS500-1800 scooped the Best Wide Format Textile Printer accolade, while the Mimaki JV400LX Series was named the Best Environmental Printing Solution. The Mimaki JV400SUV also got in on the prize-winning act at Viscom Frankfurt. The solution won a Best of 2012 Award, in the Large Format Printing category. In 2012 Mimaki underlined its status as a responsible supplier and reinforced its commitment to decreasing its environmental footprint as evidenced by the companies support for the EcoPrint show. During the event it demonstrated how environmentally-friendly systems can create a more sustainable print infrastructure, without compromising print price, production speed or quality. To highlight this even the Mimaki booth was made from environmentally-friendly natural materials, which the company donated to Möbelwerkstatt Werder, a small organization that makes furniture from recycled wood. Mimaki also underscored its broad perception on sustainability when it ‘adopted’ a Sumatran tiger at Barcelona Zoo. In doing so, it sponsored the Mimaki Nature Education Program, an initiative that supports educating young people and children on nature and wildlife.